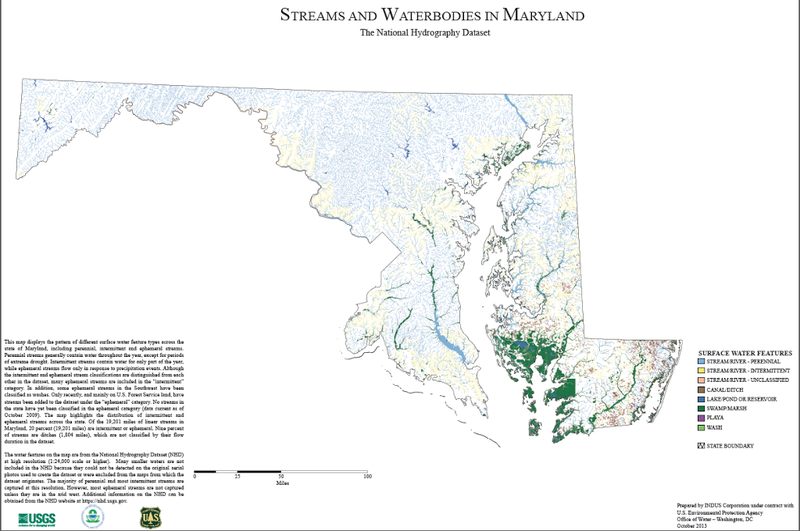 A new rule proposal by the U.S. Environmental Protection Agency will give the agency authority over 19,000 miles of streams and other “intermittent” or “ephemeral” bodies of water in Maryland. Hydrography maps provided to the House Science, Space and Technology Committee by the EPA detail the scope of the proposed rule. The proposed Waters of the United States rule, which would give the EPA jurisdiction over millions of miles of streams across the United States under the Clean Water Act, has generated bipartisan backlash in both chambers of Congress. The EPA maintains that the new rules would not enlarge the scope of its authority under the Clean Air Act, and that the rule would clarify its authority and provides regulatory certainty in the face of recent Supreme Court decisions. The EPA maintains the maps provided to the committee are not related to the Waters of the United States Rule. However, the map of Maryland plainly shows how much more authority the rule would give over bodies of water in the state of Maryland. Looking at the map the vast majority of bodies of water are classified as perennial (blue), and the proposed rule would give EPA jurisdiction over much of the rest classified as intermittent (yellow).